I enjoy viewing well-made photographs on certain websites. 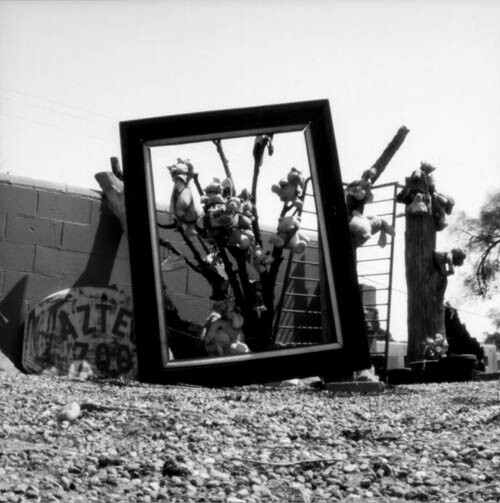 For instance, the Toy Camera Forum often displays galleries of images that appeal to me for their square format, black & white image tone, softness and light falloff in the corners - the classic 'Diana' or 'Holga' look. Even though most of the cameras being used have plastic lenses, and are considered 'disposable' or 'junk' by the standards of the photo-professionals. 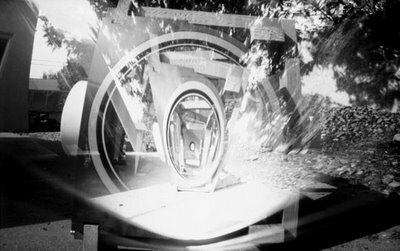 Similarly, I gain tremendous enjoyment from viewing and participating in an exchange of images and ideas on the pinhole photography forum at f295. Interestingly, at the same time, I don't get much out of ultra-sharp, moody, slickly produced landscape images. I think it's not as much the image itself that bothers me, but what the 'production values' implicit to the image speak to me: cliché. Cliché in the drama presented by the landscape. Cliché in the split filtering of the sky in certain color landscapes. Cliché in the darkened, dramatic sky in certain black & white landscapes. Cliché in the ultra-saturated colors of the floral or lushly vegetative landscape. It becomes as meaningless as watching too many action movies. Ho-hum, just another car chase or shoot-'em-up scene. Images such as those mentioned seem to be engaged in an overt, poorly disguised form of crudely emotional manipulation, of the kind one becomes all too familiar with from watching commercial television, or any other highly mediated format. Mediation: that seems to be the key to understanding my feelings. It's a term one doesn't regularly happen upon, outside of the milieu of university media studies. The concept of mediation presupposes that all physical forms of communication impart their own coloration and filtering to whatever is being transmitted. Implying that the communication channel itself guarantees that there can be no unbiased facts presented. The mere presence of information being conveyed via newspaper, magazine, TV, radio or website is proof positive that bias is present. The truly unbiased communication channel contains only dead air. Randomness. Once any information is added, it is immediately distorted by the very mechanism that conveys the information: it has become mediated. In our search for truth it is imperative that we understand and harness the power of mediation, if we are to effectively communicate at all. It therefore becomes necessary to explore the "noise floor", to borrow a term from the television field. For if randomness equates to a truly unbiased communication channel, then increasing the noise level becomes, counter-intuitively, the only true path to freeing up a medium from the debilitating effects of mediation. And therein lies the secret behind the enormous, global push to advance hi-definition television: rather then freeing us from the distortions of the older media's 'artifacts', the promises of the new media only disguise its intrinsic capability to control, manipulate and distort, through the falsehood of its supposed ultra-clarity. Beware what is hidden behind the spectacle of clarity: the truly invisible. Photographs are proxy-holders. They possess an Orwellian Newthink duality whereby the viewer simultaneously holds two diametrically opposing views to be equally true: that, on the one hand, the photograph possesses the power to be equated with the subject represented; and second, that the photograph is a mere representation, an abstraction, of a disparate subject matter. This duality defines the chasm between what we now know as art versus craft. Art suspends disbelief long enough for us to know that the picture of a mountain is, in fact, a mountain; craft suspends the suspension of disbelief for us to know that this is, in fact, a picture of a mountain, and not the mountain itself. The focus of craft upon the materials and techniques at hand helps to break the spell of Orwellian Newthink that possesses contemporary media. Artifacts. Art + i + fact. Artifacts, we were told, are unwanted byproducts of the imperfect medium through which information must be conveyed. Ghost images. Graininess. Distortions of various kinds. We were told things were getting better, that the new media would contain fewer artifacts, would be able to convey The Truth without distortion. Implicit to this propagandizing is the promise that, with the arrival of the new hi-definition media, Truth would at last be laid bare, for all to see, brought to you by our sponsors. In fact, noise and distortion - artifacts - are our lifeline, for they remind us, like some still small voice, that what we hear and see is a marketed, manipulated product, intended to sway our thinking and spending and behavioral patterns. Noise, like the scratch, hiss and pop of an old LP, remind us that we are not listening to an orchestra, but rather to surface modulations upon a vinyl disc. Artifacts break the magic of the spell. Which is one reason why I have delved so deeply into despised, lo-res photographic formats, like pinhole cameras and paper negatives. Or why others find such satisfaction with alternative photographic processes. Or why crappy plastic cameras seem for many to be much more satisfying than state-of-the-art image capture technology. People, I believe, want a picture to tell them something. No, not just something; people want a picture to tell them the truth; they want the picture to be The Truth. Which a picture can't possibly be, because it's just, well, it's just a picture, after all. The scalability effect permits processes and devices, once calibrated and fine tuned at smaller sizes, to be applied to projects of larger magnitude. Yet at precisely where the breakdown of scalability occurs remains a mystery. This is the lesson I have been engaged in learning for the last week, as I have been found to be busily crafting, calibrating and fine tuning an object now known as the 'F490 Mega-Cam'. Actually, there will eventually be a pair of Mega-Cams; that, too, is part of the story, the beginning of which goes back to some cogitating over doodling in a sketch journal. I had been thinking along the lines of 'ultra-large format' (ULF) pinhole photography for some time. 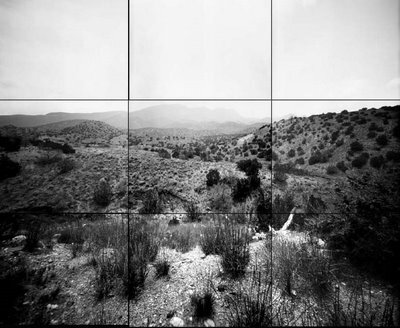 At the time, the largest format of camera that I possessed was of 8"x8" or 6"x9.5" film capacity - hardly a size large enough to convey the immensity implied by the word 'landscape'. Thinking along the lines of the finished print on display, I desired the image's size to approach the point of overwhelming the viewer, yet permit a camera and film format compact enough to physically handle and process within the confines of my diminutive darkroom. Since I wanted the quality of a contact print, combined with the convenience of paper negative media, it sounded like I was asking the impossible. The conceptual breakthrough came when I began to think about a previous project, the Grid-Cam, which combined multiple pinhole chambers projecting discrete images upon a common negative space; the resulting discrete images separated by the thin borders provided by the walls segregating each compartment. In the Grid-Cam concept, multiple views or subjects can be uniquely captured and combined, in camera, upon a compact film space. What I had in mind was just the reverse: a single, majestic view, captured upon the surface of a tessellation of smaller negatives, to be recombined post darkroom into a window-like gaze out onto this spectacular vista. Or, at least that was the intention. As for the size of the assembled tile-work of discrete negatives, I knew that I would be starting with the fundamental building-block of my paper negative work, the 8"x10" size. These are large enough to grasp a significant amount of detail, and individually seem, at arm's length, to be of significant scale, encompassing a majority of the detail-oriented center of the human ocular field of view. Yet they remain at this size compact enough to handily process and scan, and are found in ready supply at most photo suppliers. But how big of a composite image should be built? Given the physical limits of my darkroom, and my desire to have a central image pane, surrounded by neighboring satellite panes, the choice was made: a 3 by 3 grid of 8"x10" negatives, for a combined image size of 24"x30". The extent of this composite image would overwhelm the human scale of the viewer at close range, yet be compact enough to be practical to construct and execute. Then I made the decision to incorporate within this camera the 'falling plate' mechanism, which would allow more than a single image to be exposed on one outing. Armed with ideas, I proceeded to the hardware store and completed the detailed size and material selection, while finalizing the camera's design right then and there. I came home and tore into the building process at once, energized and excited by the possibilities. It wasn't until I had the box's inner frame built, and partially sheathed in Masonite, that the thought struck me as to whether or not the camera would actually fit inside the darkroom. It seemed the excitement over the potential for a falling plate camera this immense obstructed the reality that such a design necessitated a deeper box, to provide adequate room for the film plates to fall. A simple trip to the darkroom with the box frame provided the answer: it was too large to fit through the door. I entertained for several minutes the thought of how much work would be entailed in converting the whole garage into a darkroom of size adequate to load and unload the massive film plates. Then reality hit home, and I realized the answer was simple: I would cut the box in half, and make two cameras, each a wider angle of view than originally conceived, and each holding a single film plate. Armed with two such box cameras, I realized that I still had the multiple-shot capability I required for extended landscape jaunts. Cut to a week later: I've made an initial composite exposure, to learn both the good and the bad. The camera is basically good; it has a sharp pinhole, and the structure is sound. But, the corners are vignetted, cut off by some obstruction up front by the shutter, and there's a large light leak on one side. I repair the light leak, and widen the opening in the box between the shutter and the pinhole. Today I've made another exposure, this one quite impressive, a portrait of the northern foothills of the Sandias, taken with great care along the side of the road that leads to Placitas. But there's still a bit of cutoff along one side of the image - a sure indication that more work is needed. I was exploring new image-making ideas this week, conceptualizing on alternative materials one could employ in the process. One such family of products comes from the graphic arts/drafting/architecture field. The material is known generically as 'blue line paper'. There are also variants in this class, among which are black line paper - used to create final drawing prints for presentation - and sepia line paper, which is used as an intermediary upon which further revisions can be made and subsequently printed. In operation, a draughtsman would sandwich his drawing with an identically sized sheet of blue line paper. The front of the drawing would be in contact with the chemically active side of the blue line paper. The two are then ran through a developing machine together, which exposes the image of the drawing onto the blue line paper using a cylindrical UV fluorescent bulb, much like a contact print is made in a traditional silver-based photographic darkroom. When the two sheets exit the exposure section of the machine, they are separated, and the blue line paper is ran through the developer section of the machine, which exposes the paper to ammonia vapors. The reaction between the vapors and the ferrous-based chemistry on the paper causes a positive image of the original drawing to develop out. This technology is now considered archaic in the milieu of the modern architectural design studio, where CAD-based workstations abound, and blueprints are farmed out to dedicated print shops whose economies of scale permit economically viable printing via thermal toner media. Thus we find a languishing technology base of little-used blue line printing equipment and supplies, still being manufactured and somewhat readily available, ripe for appropriation by some artist intent on the purloining of these elegantly simply devices for creative image-making purposes. So it came with no small degree of interest when a story showed up on 'Make Magazine's' website a DIY project for copying old black and white photographs onto blue line paper. 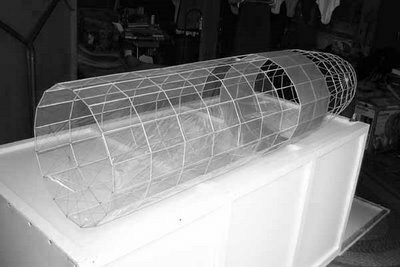 The project used window cleaning solution, containing a small percentage of ammonia, poured into a disposable Styrofoam food container, with a metal grid to suspend the paper face down above the surface of the liquid, to absorb the resulting vapors. Once contact printed in the sun, under a sheet of glass, the blue line paper is placed face down on the grid above the noxious liquid, and the tray is wrapped in a plastic bag and allowed to sit for 5 minutes. The resulting image develops out quite nicely, at least according to the article's suggestions. Several questions immediately come to mind. First, is this 'blue line' paper chemistry similar to the traditional cyanotype process as developed by Sir William Herschel, and which is practiced by many alternative process photographers? If so, it comes as a surprise that they have not discovered the usage of ammonia vapors to develop the paper, rather than the traditional water bath development. Second, would traditional cyanotype paper actually develop in ammonia vapors, and if so, would it provide a superior image quality? Third, could one successfully adopt the alternative fixing and toning steps, done with cyanotype to render it more stable, and apply these to blue line paper prints to render them more stable, as well? My interest in these questions is because of the economy of use associated with these manufactured products. One can find 24"x36" sheets of such paper for sale at 40¢ per sheet, making it much more economical to use than traditional silver-based photo paper. And since black line paper is also available at no greater cost, one can generate prints with a neutral gray tone, which is more universally adaptable to a wider variety of images than the severely blue-tinted, traditional cyanotype. There remains the big problem: creating the original negative with which one would use to make these large prints. Keep in mind that blue line paper is a reversal media, meaning that it stays light were light strikes it, and turns dark where little or no light strikes it; to use such a paper would require one to have an in-camera original that was a positive image of the scene, rather than the usual negative that is produced by normal photographic means. Obviously, one thinks about using blue line paper itself as the 'film' in the camera. It is doubtful, however, that blue line paper is sensitive enough to form an image of a daylight scene without many hours of exposure, if at all. Furthermore, contact printing such a positive original onto another blue line sheet would be better done by using sepia line paper as the in-camera media, since better definition would be gained by the UV-blocking properties of the sepia paper's yellowish line quality. As for the camera within which to perform these experiments, I would use my 5x8 binocular lens box camera for the initial experiments. Wide open, the 50mm lens would provide an aperture of f/3, which should provide sufficient light to form an image on blue line media, if it is at all possible to do so. For larger images, my 200mm diameter, 1 meter focal length, UV lens, acquired from a Nikon stepper, could be feasibly built into a large 1 meter long box camera. We find, therefore, the need to acquire both black line paper and sepia line paper before we can proceed with these experiments. We also need to attempt to develop 'sun print' paper - a commercially available cyanotype paper - using ammonia vapor techniques. I've had a particularly satisfying time in the last week engaged in one of my main creative outlets, which is pinhole photography. This should come as no surprise to anyone who has taken the time to peruse these writings, or visit one of the links on the right side of this page. I have been continually sketching, for years now, ideas for new cameras. This, too, should come as no surprise to anyone who knows me well. I have filled notebooks full with such sketchings, wherein I find it's an effective way to work out the theoretical and technical problems prior to the start of any real project's construction. What I have been sketching lately are ideas for what I have come to term 'Carousel Cameras'. In general terms, these are a subset of a larger classification of cameras that permit distant operation, using multiple large format negatives loaded in some sort of mechanism, but without the aid of conventional sheet film holders. My disdain of the conventional sheet film holder is for two reasons: first, their use deviates from the 'DIY' ethic of hand-crafted photography. Second, in larger sizes (5"x7" and larger) they can be prohibitively expensive. I have explored two other general classifications of camera mechanisms prior to working on the Carousel Camera: the first was the so-called Falling Plate Camera, which uses film plates stacked up in the rear of the camera like LP jackets in an old stereo system. A mechanism permits the front holder to fall face-down into the bottom of the camera enclosure, revealing the next film plate in the stack. This design has proven to be a workable solution, but has several problems still needing solution, the main being that the camera is sensitive to being turned upside down during transit, since the film plates that have already fallen are merely resting on the camera's floor, and are not secured in any way. Also, such a design rules out wide angles of view, because the projection distance of the camera's pinhole lens needs to be longer than the height of the film plates, in order to permit them to fall properly. I've also worked with Paper Rollfilm Cameras as another solution to taking multiple large format negatives out into the shooting environment. This system uses photo paper exclusively, by being cut into 4" wide strips, and wound into a film roll along with a black backing strip of light-tight paper. The rear surface of the black paper has frame numbers, visible through a rear viewing window, that align to the centers of each negative. In practice, this system functions as a large format version of 120 medium format film. This, too, has its problems in practice, the principle one being that the resulting paper negatives end up being rather severely curled, due to their having been wrapped around film spools. And it takes a while to load the film in the camera: each section needs to be carefully cut, in the darkroom, from larger sheets of paper, and carefully aligned and assembled into a straight strip, then carefully taped in alignment to the paper backing strip. It is also imperative that the frame numbers align properly to the centers of each negative. However, once properly loaded, these large rollfilm cameras can hold tremendous amounts of film; my newest model had (prior to its being lost in an around-the-world camera swap) the capacity to hold 24 exposures. Their non-interference design also permits wide angles of view, along with curved film planes, if that is desired. So, why then the Carousel Camera? I have found two other camera systems that seem to fit the bill, as it were; why invest time in another design? Curiosity, of course, is a major motivator. But the prototype Carousel Camera was fashioned from an empty cookie tin. It seemed a shame to discard such a container, considering its photographic possibilities. Second, once I began sketching ideas for a rotary film changing carousel, it seemed like an entirely new design concept, one worthy of further exploration. One only needs to be reminded of the Kodak carousel slide projector mechanism, to know that this is not an entirely original idea. But the manner in which a workable large format camera would use the carousel concept is more like the way those old penny arcade animated 'flip book' machines worked: a horizontal spindle loaded with film frames in the form of individual paper prints. The operation of such machines resembled what we now know today as the Rolodex, except they operated on a vertical axis, rather than the Rolodex’s horizontal axis. My prototype Carousel Camera had four vanes, in the shape of an "X", which rotated about a vertical axis via a light-tight connection through the lid of the cookie tin, to an operating and indicating handle. The size of the cookie tin was such that the film format was restricted to 3"x4". In order to make the volume of the cookie tin fit as many negatives as possible, I soon saw the possibility of loading film on both sides of the carousel vanes, giving the camera the capacity for eight negatives. This, however, necessitated a major design innovation, which was a pair of pinhole apertures installed in the sides of the cookie tin, with baffles intended to keep the light from one pinhole from fogging the adjacent negative within the same carousel quadrant. In practice, this first Carousel Camera worked fine, except the baffles were a constant problem, as they tended to obstruct and vignette the corners of the images. In such a design, rotational accuracy is critical. Over-rotation of the carousel can result in the intended negative not being exposed correctly, and the neighboring, adjacent negative being fogged. The curved surface of the cylindrical cookie tin also made for some degree of complexity in the building of the pinhole mounts. Therefore, I had intended to build any follow-on Carousel Camera into a dedicated square wooden box, which would be fashioned exactly and precisely for this intended purpose, and would be large enough to permit the use of 4"x5" media. Instead, I came upon a tall cylindrical popcorn canister, and once again I was back at it. This time the design involves a four-vane carousel that is higher than it is wide, which allows two levels or decks to be used. One pinhole is used to expose the four negatives of the upper deck, with another pinhole used for the lower deck. This time, however, the negatives are installed between the angles of the "X"-shaped vanes with the bend in the film towards the center of the carousel, and the film facing out towards the edge of the canister. This permits 4"x5" film to be installed in an enclosure much smaller than ten inches across, and also gives a wide angle of view onto a curved film plane. Having eight exposures thus loaded into this new camera gives one the possibility of distant, extended operation, much like the falling plate or rollfilm designs, but without the failings of either one. Of course, this new camera is a 'work in progress', as they say; which means that it still has bugs to be worked out. For one, the turning of the carousel is a bit rough, and second I'm still messing with light baffles in the top section, in an attempt at preventing stray light, leaking in from the lid, from fogging the film while still allowing the film an unobstructing view through the pinhole aperture. My excitement this week comes from some of the images I have made with this new camera. 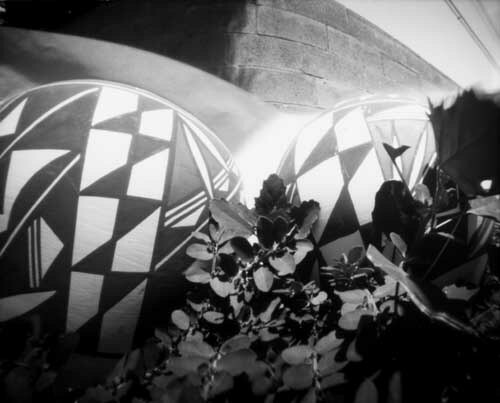 The two pinholes fashioned into the camera seem to be of high quality, and the short projection length, combined with the curved film plane, gives some very interesting perspectives. I've also had the opportunity to review my camera building ventures, because f295.org has started a new 'call for uploads', this time the theme being home built cameras and the images they've made. I sat down and compiled a list of all my cameras, and found to my surprise that I had digitized images of all of them, already in the computer. It was necessary, prior to upload, to resize all these camera portraits, along with their respective images, such that each pair would fit within the 100k upload limit. I have been interested in hobbies since childhood. I don't mean to imply that I've had a plethora of hobbies - although in retrospect perhaps a case could be made for that. No, I have been interested in the pastimes of others, what and why they find certain activities interesting. As people mature into adulthood, and the responsibilities of adulthood overwhelm one's child-like interests, many adults find themselves devoid of real hobby-like pastime activities, or perhaps substitute drinking and carousing and other adult social behavior for more innocent self interests. Yet a certain number of adults retain their child-like interests in hobby activity. Here I'm referring to hobbies such as model airplanes or trains, or kite flying, or model rocketry: activities that require a peculiarly specialized focus, and a time-dependency for the accumulation of personal skills. Yet however numerous are the distractions in daily life that prevent one's participation in hobbies (internet, sports, TV, etc) there seems to be enough interest and active participation to keep several good hobby shops in my local community open for business. And there are numerous large national hobby shop stores whose business model is focused on internet sales, as well. What interests me is how one can oversee the creation and popularization of completely new hobby activities. Why is this important to me? For one, active participation in a hobby-like pastime seems to be indicative of a healthy, robust society-at-large. Societies on the brink of catastrophic social upheaval - one thinks of Iraq or Lebanon - are not the kinds of healthy soil to promote interest in such activities. Societies where hobbies can thrive are those where Maslov's Hierarchy of Needs have been fulfilled. The need to play and create is hardly possible within a people struggling to just survive and eek out an existence. Second, as hobbies become mature activities, with a seasoned and experienced core of participants, and a manufacturing base to support the demand for specialized parts and supplies, they become pre-programmed activities, made easy and automatic by the consequences of mass production efficiencies, and the application of new technologies to the maturing marketplace. The hobby activity that once required handcrafted assembly and a skill set acquired through a journeyman's apprenticeship with an experienced, seasoned modeler mentor soon becomes ready-to-play, right out of the box. The requisite assembly skills are made obsolete by the efficiencies of mass production. Hence the need to begin new areas of hobby activity, where a high volume manufacturing base has not yet been developed, and modelers are required to creatively adapt materials and techniques from other areas of manufacturing to their newfound, fledgling area of interest. This was where I was at in the early 1970s, having been discourage from participation in the hobby of radio controlled model airplanes, and also having gained an interest in all things lighter than air - balloons, airships, Zeppelins. I imagined the creation of an entirely new hobby: RC model hot air balloons, where dozens of brightly colored balloons would fly under calm, early morning weather in luscious, grassy parks and fields. Little did I know until recently that this hobby has developed into a mature and organized activity in Great Britain and Europe, especially in Germany. And I firmly believe that it speaks volumes about why such a hobby did not form in the United States, where much of modern hot air ballooning was developed. Americans, on the whole, are not interested in hobbies, especially new ones that require careful planning and hand crafted creation of complex flying systems out of nothing at all. We have been programmed as consumers, ever-dependant upon a sophisticated manufacturing base, to supply all of our demands with the least amount of effort as possible. We are no longer a culture of free, self-sufficient and independent people. This fact, I find, is borne out in the nature of the pastime activities that we engage in. Yet I am constantly amazed at the existence of those quiet, hard-to-find hobbyists, engaged in arcane and diverse interests, little supported by a mature manufacturing base. I am referring specifically to model airships. Only in the recent last few years has there arisen a handful of manufacturers of micro-sized, indoor RC equipment and propulsion systems light enough in weight to facilitate control of indoor blimps and airships. And the internet has opened up the possibility that groups of people from diverse geographical areas can communicate and share their experiences and ideas. I find myself now communicating with a group of people I have never personally met, sharing images and ideas for model airships. Yet my enthusiasm for model airships has been dampened by the realization that many of those who join internet discussion forums over the topic of RC blimps do so, not out of a core belief in the efficacy of such an activity as an outlet for creative energy - a true hobby - but rather are predominately interested in RC blimps for their commercial possibilities. These people who fill up the discussion forums are mere business rivals of one another, intent on seeking out the latest tidbit of technical information that might make their RC blimp operation competitive. Many others are fledgling commercial operators, naively intent on being mentored into a successful business venture by their direct competitors. These are people who have not succeeded in separating the intentions and motivations of the hobbyist from that of the ‘wannabe’ capitalist. I find, therefore, that my interest in pursuing the RC rigid airship as a hobby activity is a solo venture. Those true hobbyists, not motivated by greed, are discouraged from pursuing the model rigid airship out of a misunderstanding of the technical requirements, assuming that such a flying model would necessitate an unduly large size, due to misassumptions about the weights and lifts involved. To be sure, such a hobby is a true technical challenge. Keeping the airframe of such a model light enough so as to lift a propulsion and guidance system, small enough to be practically transported and stored, and strong enough to withstand the forces of handling and flying is no small feat. It involves the same kind of structured, systematic approach that an engineer would use in the development of any other real-world technical program. And perhaps therein lies the crux of the problem: the layman hobbyist in America lacks the technical thinking skills of the layman engineer. We've forgotten how to think for ourselves, how to work out problems for ourselves. We don't believe that such a thing is possible unless we see it for sale on the shelves of some big-box retailer. We don't really believe any new thing is possible. Our confidence in self-discovery is nonexistent.